If you’ve watched the movie The Social Network, a partly fictionalized account of Facebook’s origins and co-founder / CEO Mark Zuckerberg and others, then you know he’s known for a number of youthful antics from his college days, where. Throw in some of the controversy around Facebook in recent years about privacy settings and you have fodder for conversations that suggest he’s immature, and that he doesn’t care about users. 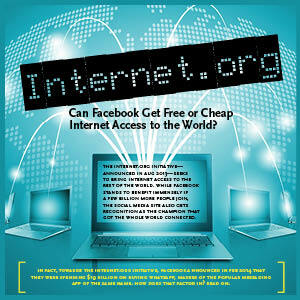 Whether any of that is true or not, the Internet.org initiative — announced in Aug 2013 — is a step in the right direction. The initiative’s goal is to bring Internet access to the rest of the world, amongst other related purposes. While Facebook stands to benefit immensely if a few billion more people join, they also get to be known as the champion that got the whole world connected. This shows Zuckerberg’s growth as a benefactor. In fact, towards the Internet.org initiative, Facebook announced in Feb 2014 that they were spending $19B on buying WhatsApp, makers of the popular messaging app of the same name. How does that factor in? Read on. Facebook and several partners (Facebook, Qualcomm, Ericsson, Samsung, Nokia, Opera, MediaTek) announced the Internet.org initiative in Aug 2013, with the goal of connecting another 5B people via affordable or even free Internet access. •	At present, 6B people have access to mobile communications. •	Only 2.7B people (just over 1/3 of the population) have Internet access. •	9% is the yearly adoption rate of the Internet — which is considered to be slow. •	Internet.org’s goal is to make Internet access affordable to the other 2/3 of the population not yet connected. •	1.23B people use Facebook (Feb 2014), an increase from the 500M in 2010, and surpassing one billion users around the start of Oct 2012. •	Even where access is available, mobile devices and cellular plans are currently expensive; content is not in the local language; and sometimes the infrastructure cannot handle increased usage. All are factors limiting Internet access for much of the 5B the initiative is trying to reach. •	The world is become a knowledge economy. So the Internet is important for learning, for staying aware even of tomorrow’s weather, for understanding an illness and being able to seek aid, for finding work, staying in touch with friends across distances, and much more. •	The Internet has to be 100 times more affordable to achieve the goals of the Internet.org initiative. •	Making Internet access affordable: The intent is to develop and offer lower-cost yet high-quality smartphones, and to form partnerships to with mobile operators and others to deploy Internet in communities with no or limited access. •	The former will require building low-cost, open source hardware for more affordable devices. The latter will require building out the infrastructure, using network extension technology to reduce the number of cell towers that need to be built, cleaning up the airwaves to use spectrum more efficiently. •	Using data more efficiently: This includes investment in tools that reduce data requirements for apps, thereby reducing the cost of cellular data service plans. Efforts will involve data compression tools, efficient networks, better data caching. ◦	Developing new business models and services for easier Internet access that are sustainable. ◦	Aligning incentives for various providers, including mobile operators, device manufacturers, and other businesses while providing more affordable access. ◦	Local services and enable more languages on devices. A 2011 McKinsey & Co. study found that GDP of developed countries increased as a result of having Internet access. •	Over the previous 5 year period (as of Aug 2013), having Internet access contribute to 21% of the GDP growth in developed countries. This is more than what the agriculture and utility industries contribute individually, and it adds more jobs. •	Over the previous 15 year period, having Internet access contributed 10% of the GDP growth of these countries . This provoked the question of whether having Internet access is a human right. It’s not, at the moment, but that’s part of the initiative’s goal. •	Facebook “believes it’s possible to build infrastructure that will sustainably provide free access to basic Internet services in a way that enables everyone with a phone to connect to the Internet.” They have already built an efficient infrastructure in connecting over a billion users (1.23B as of Feb 2014). •	10 PB (Petabytes) per day is how much Facebook’s infrastructure currently handles. 1 PB = 1,000 TB (Terabytes) = 1 billion GB (Gigabytes). •	Using their Air Traffic Control — mimics cellular network connections and congestions, which lets them test their mobile app’s behavior on handsets in, for example, India. •	Pre-fetching and WebP — uses the Google-defined WebP image standard and caches Facebook user photos — a popular feature — to control data use. The WebP standard alone help saves 20% on bandwidth. •	Prioritizing Wi-Fi — involves trying to ensure Wi-Fi use is prioritized, both for reducing data usage and battery consumption — especially for pre-fetching content. •	Tuning the Facebook app for different handsets — which involves working with chipmakers to ensure optimal app performance using less power. For phones with SD cards, pre-fetched content is saved there instead of internal storage. •	Fine-tuning wake cycles for phones — which involves using custom wake-up periods that are based on handset and network, in order to keep the power consumption down for a device wakeup and retrieving a new story item. When Does the Internet.org Initiative Get Started? It already has. Facebook bought app analytics and optimization company Onavo in 2013. Reported buyout figures range from $100M to over $150M, although the NY Times’ Bits blog says its about $120M. Onavo’s popular Extend mobile app for Apple iOS devices utilizes compression technology to reduce cellular data usage. As well, their analytics features can accurately measure how many people are using nearly any iOS app. These are all very strong candidates for use in the Internet.org initiative. Then in Feb 2014, Facebook announced the acquisition of mobile messaging company WhatsApp for a huge sum — albeit most of it in stock rather than cash — that aligns with some of the Internet.org’s goals. •	They paid WhatsApp $4B cash, $12B in Facebook stock, and up to $3B in restricted Facebook stock. •	This $19B total is 10% of Facebook’s market cap ($190B). •	Google had reportedly offered $10B for WhatsApp, and reports are that they would have paid more than $19B, however, Google denies these reports. (Google’s own initiative currently uses balloon satellites to provide 3G-based cellular Internet connections to areas without access.) However, Zuckerberg and WhatsApp co-founder/ CEO Jan Koum have known each other for years, which likely played a strong factor in Google losing the bidding — despite that the other WhatsApp co-founder, Brian Acton, was turned down for a job by Facebook in 2009. •	Facebook gains 55 employees including 32 engineers. •	There are over 450M users on WhatsApp, 72% of whom are active on an average day. •	WhatsApp had 200M users 9 months previous, making for an incredibly fast climb to 450M — quite possibly faster than any other company including Facebook. •	WhatsApp gets over 1M new user registrations daily (Feb 2014). •	19B messages per day are received, 36B sent. •	The app’s messaging service is free for one year, after which WhatsApp charges $0.99 per year. •	$150 — the amount per year that the alternative (cellular data-based messaging) costs some people. No wonder their growth has been phenomenal. •	140M new jobs would be created. •	160M people would be lifted out of poverty. •	2.5M lives would be saved by giving people access to health care information. •	7% is the possible drop in child mortality rates. •	640M children would have affordable access to learning tools and resources. •	Another Facebook initiative with Unilever in India — where only 13% of the population is connected — will study the benefit of Internet access in rural communities. •	Facebook is involved in a pilot program, SocialEDU, in Rwanda to provide free online education. 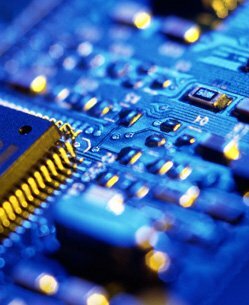 The company will provide a mobile app and look into ways to have it work on a low-bandwidth network. Nokia will provide lower-cost cellphones. •	The $19B acquisition of mobile app WhatsApp had the Internet.org initiative in mind. Also, Facebook and Internet.org initiative partner Ericsson and Facebook announced in late Feb 2014 that they’ve created a joint innovation lab, the Internet.org Innovation Lab. It’ll open in the second half of 2014, at Facebook’s Menlo Park campus and will provide “an environment and expertise for optimizing applications, networks, devices and services for the next five billion Internet users. •	Ericsson has been around for over 100 years. •	40% of the world’s mobile traffic goes through Ericsson networks. •	2.5B people subscribe to networks run by Ericsson customers. Internet.org is a huge initiative and there are big hurdles to be leaped — such as dealing with non-capitalistic or corrupt governments, as well as having cellular carriers onboard, building out infrastructure and more. However, it’s a noble effort and shows a maturing Mark Zuckerberg, even if Facebook ultimately stands to benefit from having more users. The Internet has arguably brought many more positives than negatives, and can do the same for other countries, for more people. Short of an asteroid hitting the Earth, the Internet is not going away, and life has changed as a result — often for the good. More people being connected online is a good thing for the world as a whole.